This beautiful home offers quality accommodation at Highlands Reserve Golf Community! 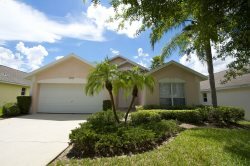 A spacious three bedroom home situated on the gated community of Southern Dunes, one of the finest golf communities! This absolutely lovely home offers quality accommodation at Highlands Reserve Golf Community. With fully screened pool and deck overlooking protected conservation area. Highlands Reserve is close to all the main theme parks and community includes a championship golf course, a large communal swimming pool, a children's play area and a tennis court. For the golfer - this home is only a few minutes’ walk from the club house and with a host of championship courses a short drive away it makes an ideal base. The master bedroom has a king-size bed, remote television, large walk-in wardrobe and an en-suite bathroom, with a large shower and separate bath. It also has patio doors leading directly onto the pool area. Dressing table and two bed side drawers. Bathroom with a bath and inset shower, wall mounted hair dryer. The second bedroom features a queen size bed, remote television, fitted wardrobe, chest of drawers and bedside drawers. The 3rd and 4th bedrooms each feature 2 single beds, remote television, fitted wardrobe, chest of drawers and bedside drawers. The villa has a spacious living / dining room. The living area contains 2 double sofas. The dining area has a stunning glass topped table to seat 6 for elegant dining. The fully fitted kitchen includes a double door American fridge/freezer with ice maker, a family size dishwasher and a built-in microwave oven. There is also a breakfast nook with table which seats 6. The utility room includes a washing machine, tumble drier and an iron and ironing table available. This leads to the Garage. From the kitchen you lead into the family room with cable TV & VCR, 2 small sofas, 1 lounge chair. Also leads out through patio doors to the poolside. The family room leads out to the fully screened swimming pool and patio area. There is a covered area for those seeking shade from the glorious Florida sun. The patio is equipped with sun beds and a table and chairs for 'al fresco' dining. There is a pool blanket to retain the heat in the pool overnight.. We provide all bed linens, towels etc. All bedrooms are equipped with a clock radio, cable TV and have ample closet and drawer space. The telephone is free for all nationwide calls and can be used with a credit card for other calls or (more economically) with pre-paid phone cards from the local supermarket.